The term peafowl can refer to the two species of bird in the genus Pavo of the pheasant family, Phasianidae. The African Congo Peafowl is placed in its own genus Afropavo. 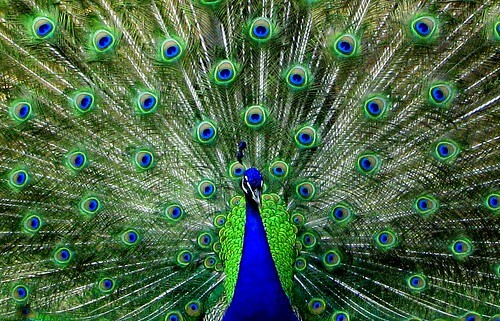 Peafowl are best known for the male's extravagant tail feathers, which it displays as part of courtship. The male is called a peacock, the female a peahen, though it is common to hear the female also referred to as a "peacock." * Indian Peafowl, Pavo cristatus is a resident breeder in the Indian subcontinent. The peacock is designated as the national bird of India. * Green Peafowl, Pavo muticus breeds from Burma east to Java. The IUCN lists the Green Peafowl as vulnerable to extinction due to hunting and a reduction in extent and quality of habitat.